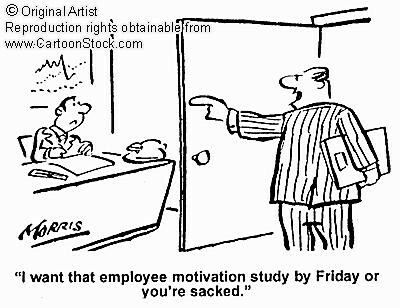 1) Accept responsibility: start by viewing yourself as the cause of the underperformance or lack of motivation of your staff. If you think this way, 92% of the times you’ll be correct. Leadership and motivation starts with you. 2) How are you on the emotional side? Are you energetic, enthusiastic, striving to reach great goals? The fact is, if you are not enthusiastic or cheerful yourself, you can hardly hope to motivate others. 4) Work on people's strengths and they’ll get stronger. If you work the other way around (concentrating on people's weaknesses), they will get weaker and weaker. In personnel management you really get what you push. Study the "law of attraction" and apply it. 8) Coach your people often. A real leader is someone who brings his followers to results. It is not the other way around. 9) Keep a high level of personal ethics. Keep a high integrity, not only at work but also at home. And remember: if you want things to change, if you want your people to be more productive and more engaged in the company, the first one who has to change is you.